One contributing factor to the astonishing spread of alarm over CO2 and climate may be that most of us have not given much thought to climate other than complaining about bad winters/summers/storms or recalling sunnier times in our childhoods. So the notion that the climate is changing worldwide, which ought to be as banal an observation as you can get since it has never stopped changing over a great range of scales, can yet come as a bit of a jolt. And when some at least of the folks in white coats tell us we're causing the change, and that it must be for the worst, we get a further jolt. And then when the unscrupulous or the merely irresponsible spot an opportunity to scare us for their financial and/or political advantage over 'climate change', then the jolts can arrive thick and fast - from the media, from the eco-activists, from the anti-capitalists, from the fundraising NGOs, from the financiers and investors in carbon credits or in the farming of subsidies for renewables, and from the politically ambitious who spotted the bandwagon in good time to help it along or who were merely swept along by it and all the opportunities it has provided. 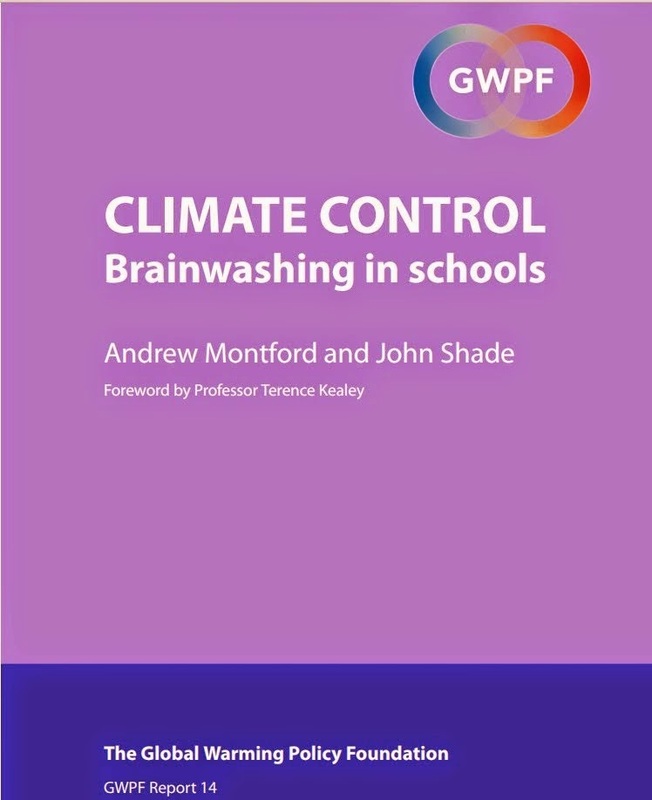 One result of this headlong, headstrong stampede based as it is on mere supposition that the extra CO2 must have such a powerful directional effect on climate that we should be acutely alarmed by it, is that educators at all levels have been swept along too. 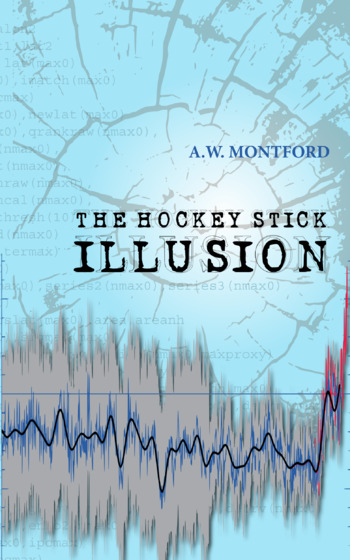 Many seem to be enjoying the chance to be spreading alarm amongst the young, given the explosion of websites, books, and other media aimed at them. A common approach is to mention greenhouses - well known as hot and uncomfortable places - or cars parked in the sunlight with all windows closes - and assert that CO2 has the same effect on atmospheric temperatures as the glass has. Not true of course, but truth is not a key concern where supposition suits so many. Another picture might show a high wave crashing against a seafront, covering nearby houses in spray, and be accompanied by dire warnings of dramatic rises in sea level underway, even accelerating. Not true of course, since the slow ongoing rise of sea levels seems to be paying not the slightest attention to rising CO2 levels, and may even be flattening out in recent years as it has over the past thousands of the bigger picture. But these untruths are helpful when you are making the case that humans are disrupting a fragile nature, heretofore in balance. And of course, nature is neither fragile overall nor has it ever been 'in balance'. No matter, we humans must be a bad lot, our inventions, our achievements in engineering and in food production, our tremendous victories over poverty and starvation, and over the vagaries of a variable climate, are to be decried in so far as they produce CO2. That gas which does not act to raise temperatures like the glass in a greenhouse does, which does not appear to have ever been a driver of climate - in recent years or over millions of years, and whose recent rises coincide with both rising and declining temperatures, and with essentially business as usual as far as other weather or weather-related phenomena such as ice extents are concerned. The madness over CO2 will surely continue to subside, and as it does, a calmer curriculum on climate will have to be found. What might it look like? Here are three items which caught my attention recently and which may be just the sort of thing that could inspire sensible and informative teaching on climate topics. 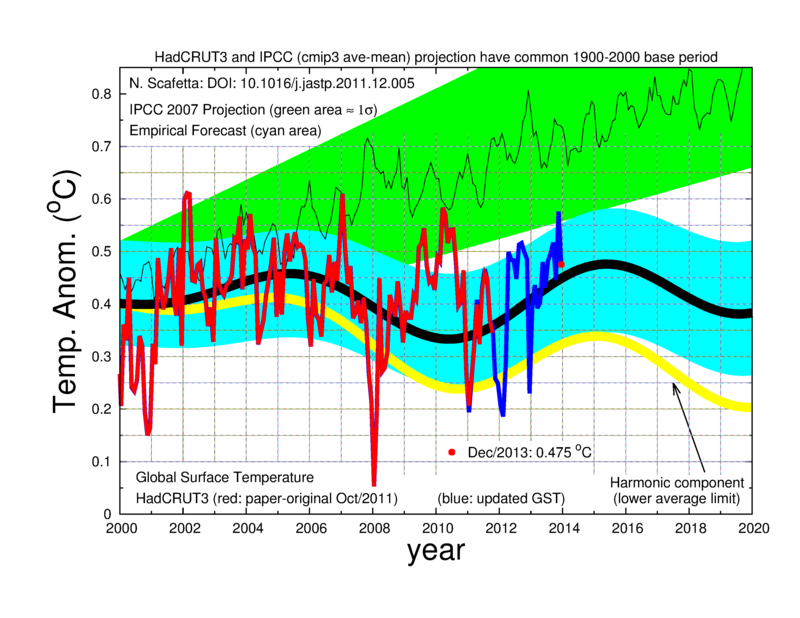 This diagram is due to Kiminori Itoh who used it in a guest post on the blog Climate Science: Robert Pielke Sr. Such a diagram is not too complex. It uses the idea of rivers flowing into each other, with many sources, and more than one outlet - to show more effects than just temperature changes. CO2 can thus be seen as just one of several contributions, and we can readily imagine there may be many more. Just as we could imagine a great river system as having innumerable sources or springs. Feedbacks are not shown, but could be mentioned to appropriate classes by noting, for example, what regional climate changes could lead to more aerosols, or what temperature changes might produce more or less vegetation, or more or less de-gassing of CO2 from the sea. Contrast the more complex river system with the one above it - which is of course the nearer analogy to the worldview pushed by the leaders of the IPCC. Item 2. Many, I'm tempted to say all, of those scientists most agitated by CO2 do not possess much by way of the gravitas associated with great achievement in physics. Many are more like geographers than scientists in so far as they are documenting and describing and modelling what they believe is taking place rather than deriving results from hard theories which they rigorously test with new data. 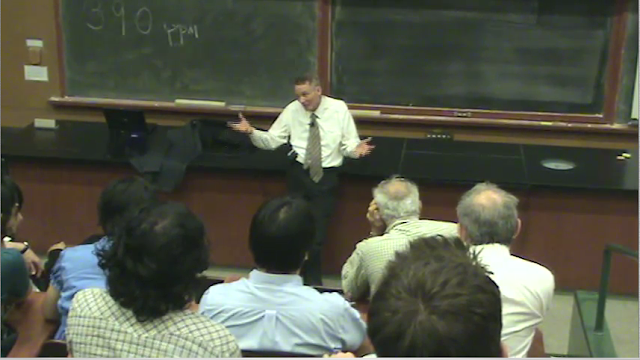 There is a video showing an easy-paced talk on climate given in 2010 by a very accomplished physicist, William Happer of Princeton University, reported by Luboš Motl who also provides a summary of the contents. As Motl notes, it is instructive to listen to the list of achievements of Prof Happer (given by the lady introducing his presentation) and wonder how they might compare with those of physicists on the agitated side of the CO2 debate! The video can be downloaded from here: http://digitalassets.lib.berkeley.edu/physicscoll/ucb/video/col.streaming.11-01-10.mov (I watched it using Quicktime, but to get the soundtrack to work properly when Happer comes on, I had to mess around a bit. In the end, I got it to work by adjusting the 'Wave Balance' to the left - a control option which appeared via 'Volume Control' in Windows XP). I commend the presentation because it brings back memories for me of the very high quality of professors I was lucky enough to listen to many decades ago, and who would all, I like to think, have had no truck with the facile and irresponsible alarmism of so many of their counterparts today. The presentation is calm, the discussion session frank and amiable, and there are no grandiose appeals to authority nor scaremongering. It is not perfect - stronger answers would be possible for some of the questions and points made, but it is honest and straightforward. I think there are videos of Prof Lindzen which convey the same sense and sensibility, and these too could be used to help inspire better materials for schools. The report is on one of the many 'climate alarm' websites (e.g. 'The climate crisis isn’t just some far-off threat: it’s a clear and present danger. Galvanized by this sobering reality, Climate Central has created a unique form of public outreach, informed by our own original research, targeted to local markets, and designed to make Americans feel the power of what’s really happening to the climate. Our goal is not just to inform people, but to inspire them to support the actions needed to keep the crisis from getting worse.) so I hope I am not being misled by it, but I found it encouraging. The teachers involved do not seem to have set out to scare their pupils, and have also made a point of discussing positive and negative effects of particular changes in climate, or policy options such as oil pipelines. They also looked at real data, asking 'how do we know?' and 'where is the proof?' Finally, they were out in the field, not in a laboratory, not in a computer room, not watching a DVD, and doing measurements of their own. I like to think the teachers will have helped the children feel we are not feeble victims of climate, but rather we can do and have done many things to protect ourselves from its variations. A sensible level of confidence and optimism about the future would be good results from a calm curriculum on climate. That's a schoolteacher in the picture, setting out to scare children about methane. Disgraceful.